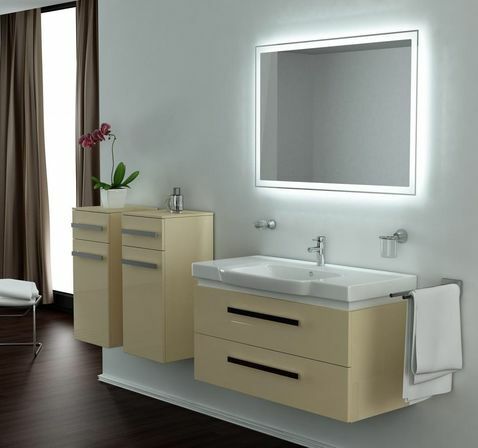 It is hardly possible to imagine contemporary bathroom without a mirror. Though mirrors play many roles in bathroom interiors – for instance, decoration, creating optical illusion of extra space – their main purpose is to give appropriate reflection. Typically people start their daily routine with grooming after morning shower – shaving, drying and brushing hair and even applying makeup – in front of bathroom mirror. And at the end of the day they do the opposite routines in front of this very mirror again. So, if basically every day we see our first reflection and last reflection through bathroom mirror, we need to make sure we get an adequate reflection – precise enough to draw a perfect line with eyeliner or shave cleanly yet at the same time flattering enough to make us smile at our own reflection before going to bed. And here comes the turn of bathroom mirror light. 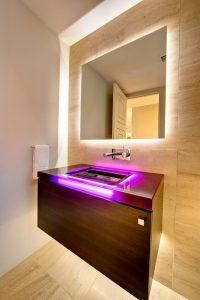 Esthetics – bathroom mirror lights should fit in a whole interior concept, enhancing style of the room, as well as meet personal taste criteria of owners. 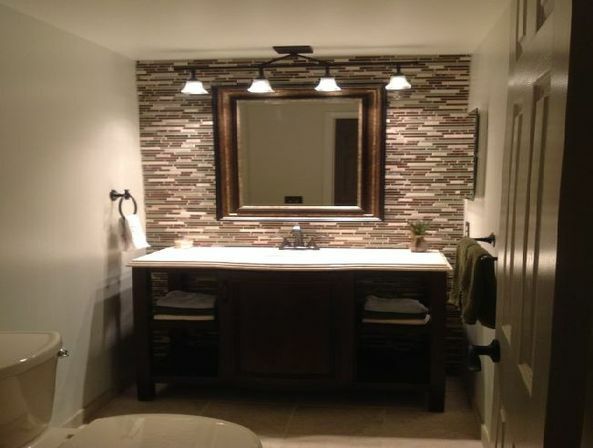 Different types of mirrors and different interiors require different lighting. There are many ways to organize lighting of bathroom mirror. No special lighting is provided for bathroom mirror area, main descending lamp in the middle of the ceiling serves as the only source of light. This is not good lighting solution even for relatively small bathroom because not enough light is provided for such tasks as shaving and applying makeup. The light coming straight down from the ceiling might cast rough shadows over person’s face. Summing up, this type of lighting is not recommended, it is necessary to plan targeted lighting for such an important bathroom zone as bathroom mirror. Lamp, descending from the ceiling just above the mirror. This option is slightly better than previous one. Being placed just by the mirror, it gives more light. But the way this light is directed straight downwards can’t provide even lighting of person’s face, casting shadows under eyes, chin, etc instead. The brighter light is the rougher shadows it would create. Overall, this type of lighting makes grooming routines difficult and inconvenient and brings out all flaws and imperfections at the same time. Thus, this type of lighting is not recommended. Best light is provided if it comes towards face approximately from the level of the eyes or slightly above. Point lighting’s been very popular lighting solutions, especially in such rooms as hall and bathroom. If tension ceiling is mounted, many contractors even often give away several point lights with installation for free. Generally, point lights have many benefits – give a modern note to interior, help zoning room space, enhance complex decorative multilevel tension ceilings, have very reasonable price and last long, provide high level of safety in the bathroom, being secured far from any source of water. On the other hand, they have some serious disadvantages and restrictions. First of all, this lighting, being perfect for modern, high-tech and minimalistic interiors, will not fit in such stylistic solutions as classic, country and rustic, vintage, retro, antique and many others. Second, it gives very harsh narrow-directed light beam and thus provides very unflattering reflection and doesn’t provide adequate light for grooming rituals. 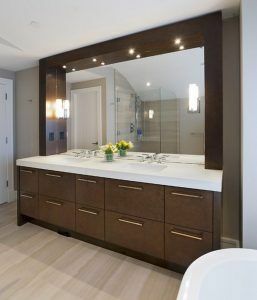 It only can be recommended as a built-in light in cabinet mirror when a mirror with shelf is attached to one side of cabinet in a way that lighted bathroom mirror sits in a niche and light, coming from niche does not cast shadows. 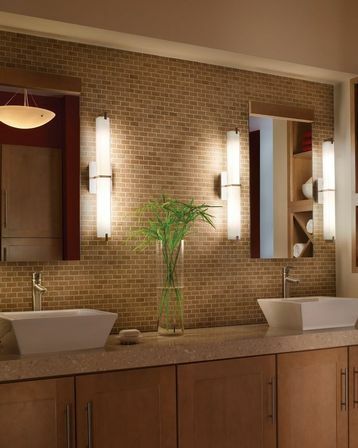 Bathroom sconces on each side of the mirror can be quite a good option for many bathroom interiors and types of mirrors. They come in a wide range of designs – from hi-tech aluminum pipes to classic chandelier-like sconces and contrast colored lamp shades, reproducing retro styles. So, one can choose sconces for most any interior – from hi-tech to country vintage bathroom. 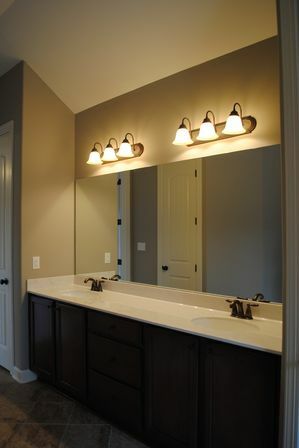 If there are two sinks and two vanity mirrors or one big double mirror, then it might be necessary to hang three or four sconces to provide enough light for both persons using sinks. 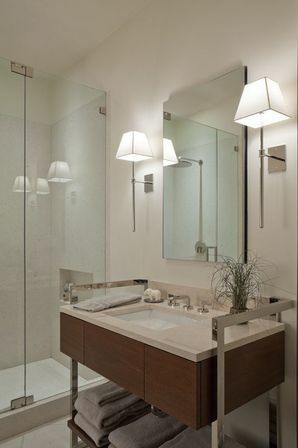 When deciding on how many bathroom lighting fixtures over mirror should be put, it is important to consider size of mirrors and level of lighting in other areas of bathroom. Sconces with flexible handlers could be very useful since they allow setting the light the way it is needed and in pair with cosmetic magnifying mirror can provide ideal definition of reflection for such routines as putting on makeup or shaving. Bathroom mirrors with lights. 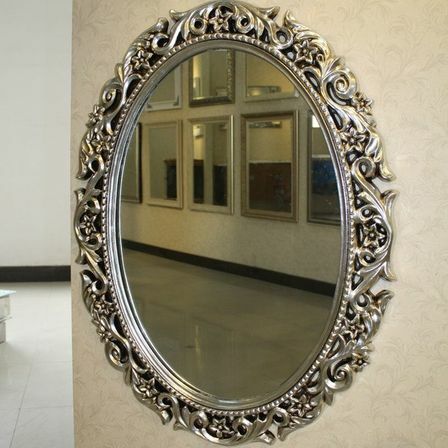 This type of mirrors is very popular recently. Lighted bathroom mirrors are usually based on LED strips which is very practical when it comes to questions of energy saving and safety. These mirrors provide very precise yet flattering reflection due to soft even light distributed outwards mirror surface and they also create warm relaxing atmosphere which is very important for bathroom. 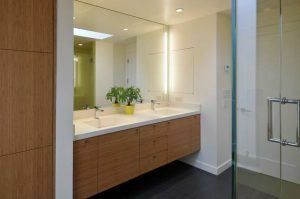 Bathroom mirror with light can be chosen from a wide variety of ones on the market. Mirrors vary by positioning of lights – some with lighting fixtures fitted to them while others with lighting system adjusted along the frame; there are also different designs of illumination and frames. 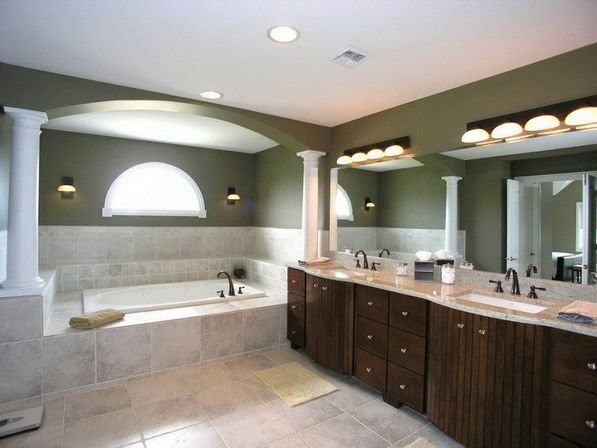 Some models have an option of switching colors which enables to turn the bathroom into SPA-retreat momentarily. Other handy option many lighted bathroom mirrors are provided with is anti-fog feature by means of in-built heating pads. Illuminated mirrors can naturally fit any contemporary bathroom interior while they unfortunately do not fit old-fashioned retro and country styles. Lighted bathroom mirror with shelf. Shelf is a practical bathroom accessory which provides an extra space for storage and prevents bathroom sink from clutter. If there are enough cabinets for storing in the bathroom, this shelf can be used for decoration – some sea shells or colored glass drops, illuminated by soft LED lights, would look very stylish. Lighted cosmetic magnifying mirror. This mirror allows applying makeup as precise as it can be. It is recommended to use magnifying mirror as additional one along with standard big wall mirror rather than instead of it. Backlit bathroom mirror. 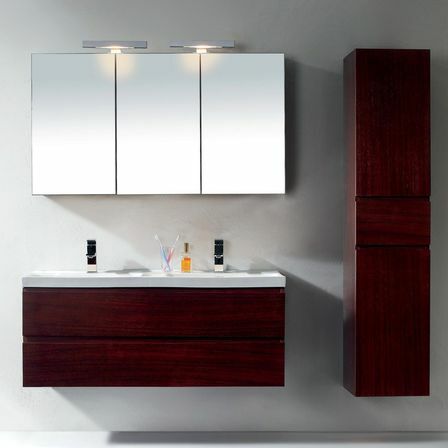 This type is based on LED strip similar to previous group, but lighting fixtures are secured on the backside of mirror. Bathroom mirror with light, softly streaming from behind, looks as if it is floating. 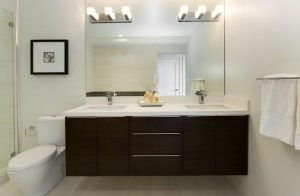 This type of mirror lighting provides both clear flattering reflection and relaxing atmosphere. 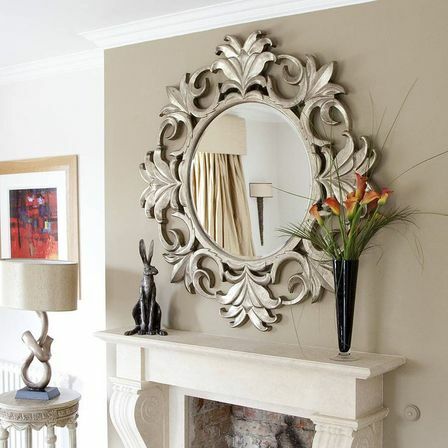 This mirror looks softer than previous ones and very carefully can be fit into classic and retro styles.